special collections – What's Cookin' @ Special Collections?! 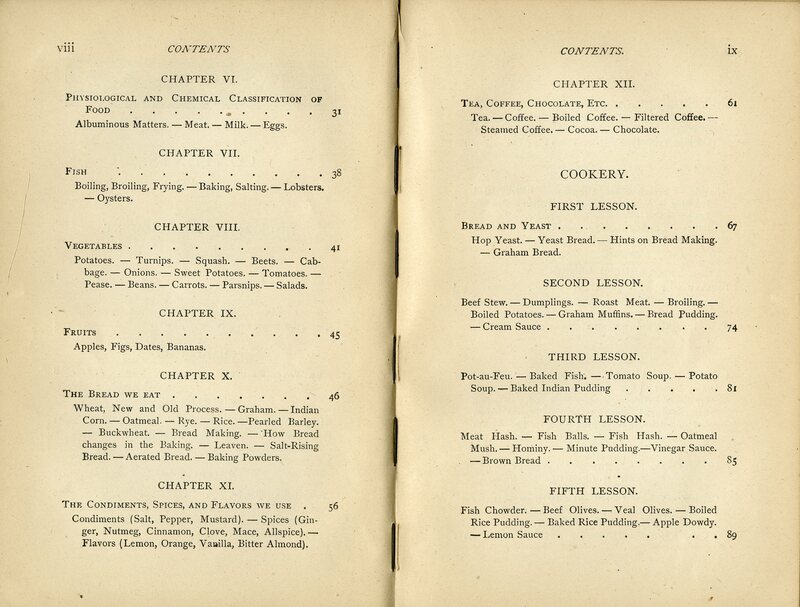 As promised, this week we’re at the end of processing the Educational Cookery Collection (yay)! And, I remembered to take pictures while I was working on the collection this week, so there are plenty of visuals below! In the end, they don’t take up the whole box, but that’s okay. I used the lid as a temporary spacer to keep folders from slumping or falling over, which can damage the contents over time (that’s also why, in the picture above, I turned the box on its side as I started added the first few folders to it). Before I put the box on the shelf, I made a more permanent spacer from some left over cardboard. (We keep many different kinds of scraps around here that come in handy for reuse: cardboard, old boxes, mylar, matboard…Plenty of archivists like to reuse and creatively “upcycle” where they can!) Also, this means we have space to add more items later! The other part of processing, of course, is the intellectual description and processing. We use software called ArchivesSpace, which lets us keep track of new accessions, digital objects (scans), subjects, and creators, and helps us create the finding aids we put in Virginia Heritage. If you’re curious what it looks like, this is a screenshot with the list of folders for this collection. The navigation links in the lower left help us jump around the rest of the record below, since more complex collections can have a lot of content. As I finished writing up the notes in the collection, I also grabbed a screenshot of those. The software consolidates sections with a lot of content (like the Subjects, in this case) and when you are viewing a section (like the Notes), shows you shortened versions, which you can expand and edit. I promise, it can save a fair bit of scrolling if you’re trying to get a specific section. The sidebar on the left shows you, at a glance, connections between this and other records or how many elements there are in a given section. In this collection, for example, there’s a link between this and one existing accession record, a single “date” component, and 9 notes. So, we encourage you to come by and take a look when you have a chance! I expect this collection will grow in the future (much like some of our ephemera-based collections), and I’m looking forward to finding out what we add next! 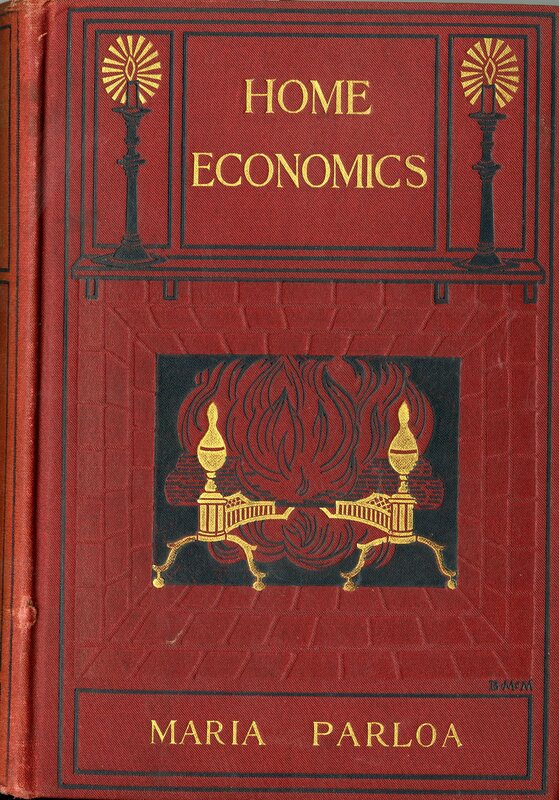 Special Collections is on Twitter! Just a quick announcement: Virginia Tech Special Collections and University Archives has joined Twitter! If you tweet, follow, or just want to check out our page, you can find us @VT_SCUA or at https://twitter.com/VT_SCUA/. We’ll be tweeting photos, facts, exhibits, events, blog posts, and more. Of course we’ll be including things about and from the History of Food and Drink Collection, so be sure to keep an eye out! If you’re a long-time follower, I hoe you’ll forgive me for going a bit more off track than usual this week. You know that usually I would post images and commentary/history on an item from the History of Food and Drink Collection. The thing is, last week, I got to do something amazing and 100% food history related. And I really want to talk about it. I think it may give our readers more insight into some of my future hopes/dreams for the collection, and you’ll learn about my passion for food history. It’s going to a long post, but I’ll keep my comments short and I promise there are pictures. 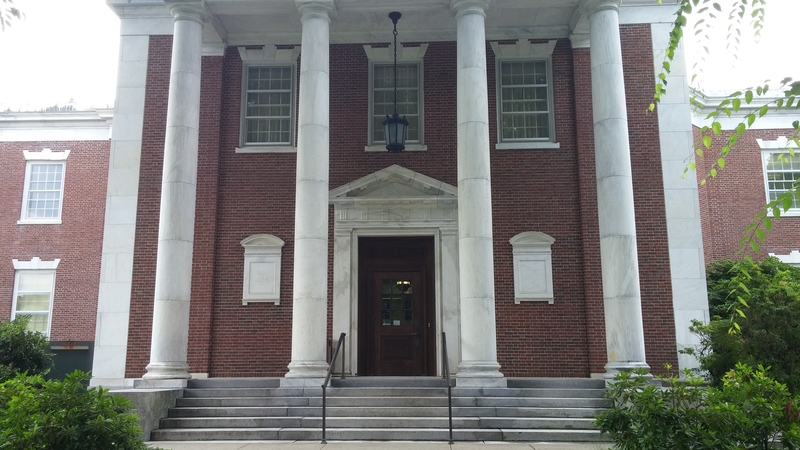 Each summer, the Center for Historic American Visual Culture (CHAViC) at the American Antiquarian Society (AAS) hosts a week long seminar. Each year, the topic changes and you’ll never see quite the same thing again. 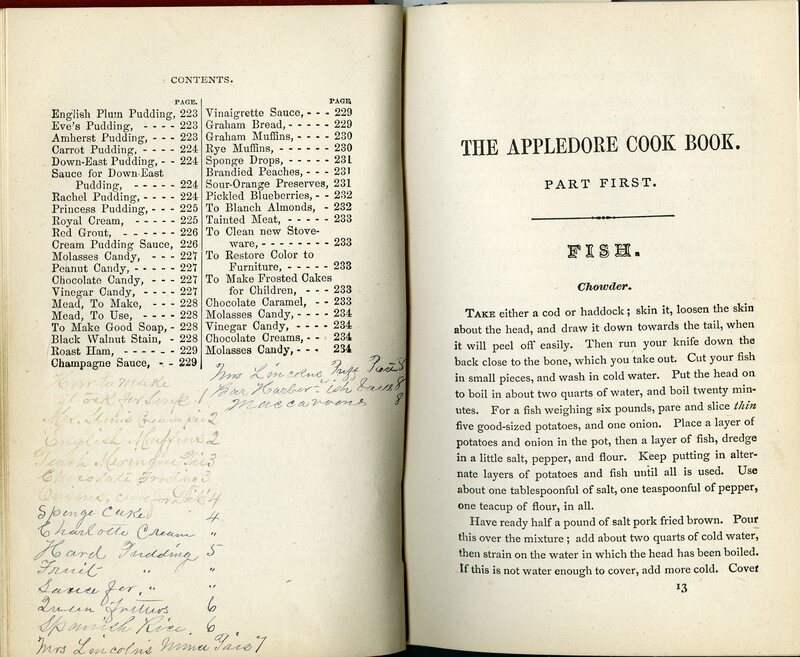 This year, the theme was “Culinary Culture: The Politics of American Foodways, 1765-1900.” You can read more about it online. As soon as I heard about it from a colleague who attended last year, I knew I had to go. Luckily, the faculty member leading the seminar agreed and I was accepted. The front of the main American Antiquarian Society building, Worcester, MA. My week was spent in the company of graduate students, faculty, and a couple of other library types from a variety of disciplines: History, Art History, English, American Studies, and Religion Studies. 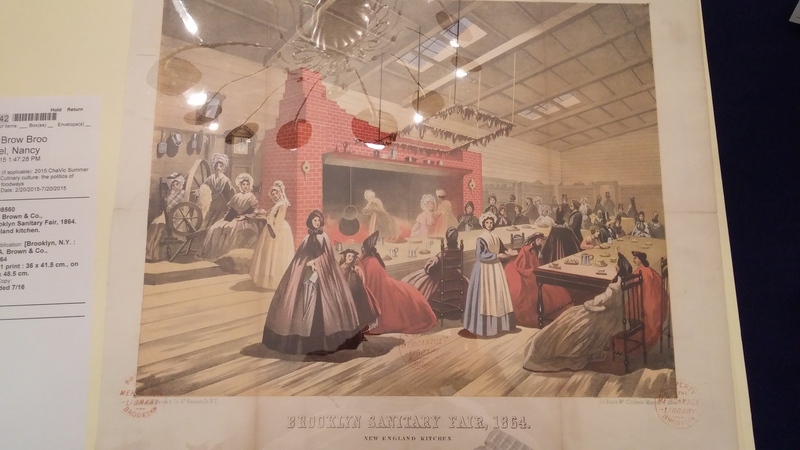 Led by a visiting faculty member and assisted by the staff at the AAS, we had lectures, hands-on workshops (with books, prints, ephemera, trade cards, images, and artifacts), field trips, and even time to do our own research. The archivist in me was giddy from the behind-the-scenes tour, the scholar in me was gleeful about playing in someone else’s archives, and the collection manager in me was thrilled to talk about and learn how and why people from diverse backgrounds study food and food history. On our first day, we were shown a number of objects related to food and asked to pick one. Over the course of the week, we were supposed to keep thinking about the object, how what we talked about changed our understanding of it, and, on the last day, give a brief informal presentation about the object as an item. Some people put the object in the context of American culture at the time, others talked about how it could be used in a classroom setting to engage students, and still others used the object as a jumping off point for broader observations about what the item represented. I chose this 1759 advertisement for a merchant in Boston, printed by one Paul Revere. It was accompanied by a handwritten receipt for the items purchased by a customer, around which the ad would have been wrapped (you can still see the fold line under “Large & small Spiders” below). 1759 Advertisement for merchant Joseph Webb of Boston. Printed by Paul Revere. Handwritten receipt from Webb to Obadiah Dickinson, 1759, accompanying the advertisement. I could probably write a paper on what I talked about for those short 5 minutes, and I won’t linger on that today, but it won’t surprise anyone to know I focused on how this might fit in as something I would show a visiting class and what it says about culinary activities in early America. Hand-colored tea plant illustration, Ladies’ Wreath and Parlor Annual, c.1854. The Grocer, 1827. 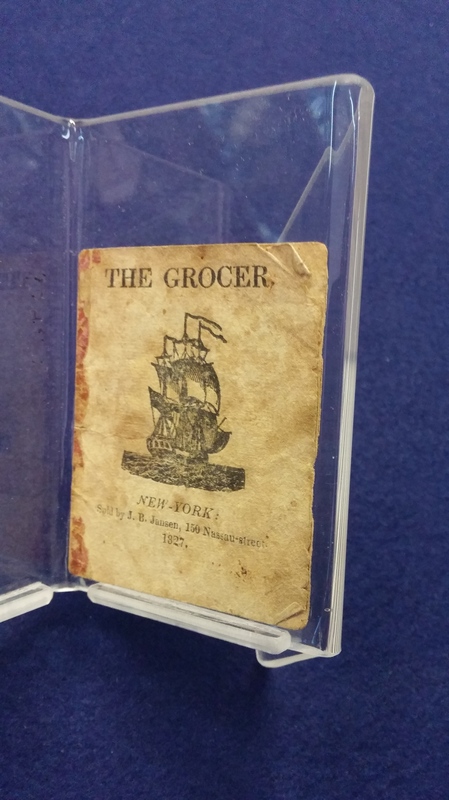 This tiny book contained rhymes for children relating to food, including the title piece about what a grocer does. Of course, you don’t put a group of scholars obsessed with food together and not cook. During a trip to Old Sturbridge Village, we cooked an 1830s meal over an open hearth from scratch (stuffed and roasted chicken, mashed potatoes, carrots, rolls, greens with burnt butter dressing, lemonade, pounded cheese, and “Washington Cake” with hand-whipped cream, plus we churned and washed our own butter!). It was an eye-opening experience to actually prepare this meal and if it weren’t for 20 sets of hands, it would have taken well more than our 3 hours. 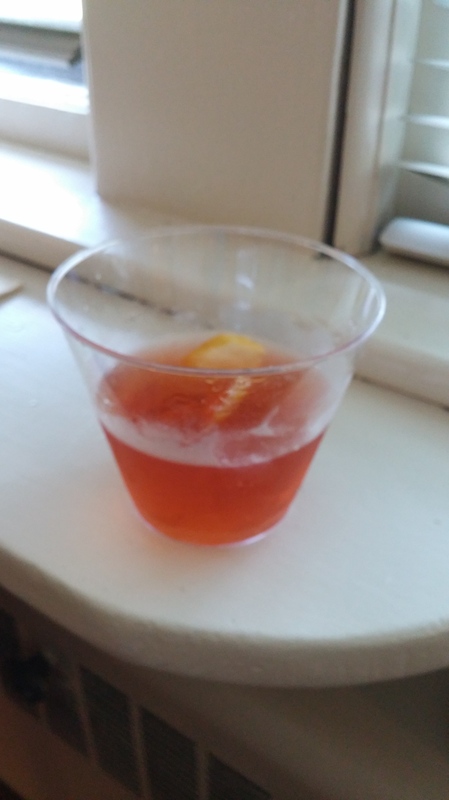 We tasted and talked about hard cider, cheese and cheesemaking, and Sazeracs and other historic cocktails, and bravely sampled hardtack. On our last day together, we made gingerbread as dessert for the evening’s cook out. 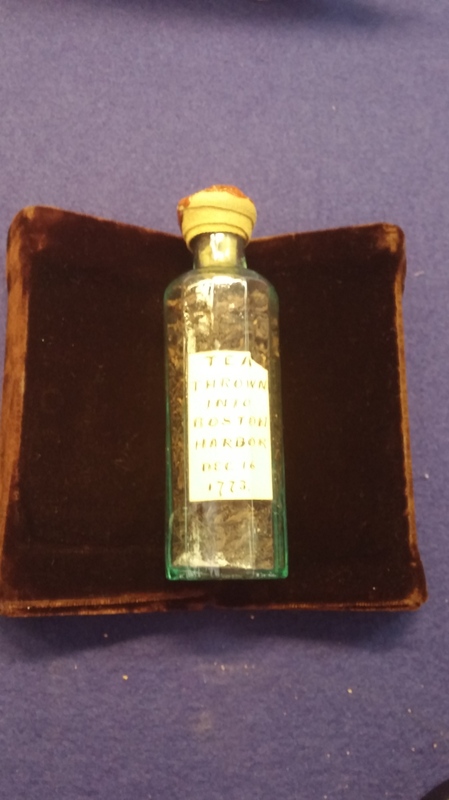 It was Eliza Leslie’s 1827 recipe that included a pint of molasses and four different spices. Dense as it was, it tasted amazing and I’m looking forward to making it at home for friends. 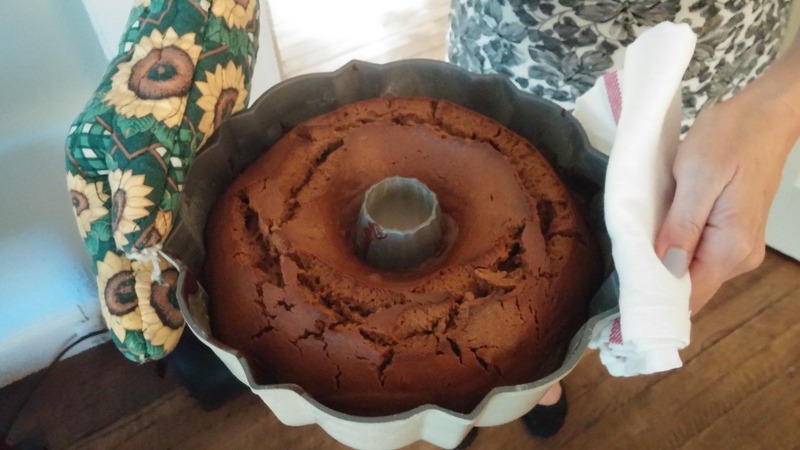 Eliza Leslie’s 1827 recipe for gingerbread, made in 2015! Besides the fun, my pile of notes, new knowledge gained, and the chance to do research (why yes, I DID find some interesting cocktail history in manuscript form, but more on that another day), there was something even more important I learned last week and it was a large part of what I wrote about in my application essay. I wanted to meet people from different disciplines who studied food and I wanted to know why they did. 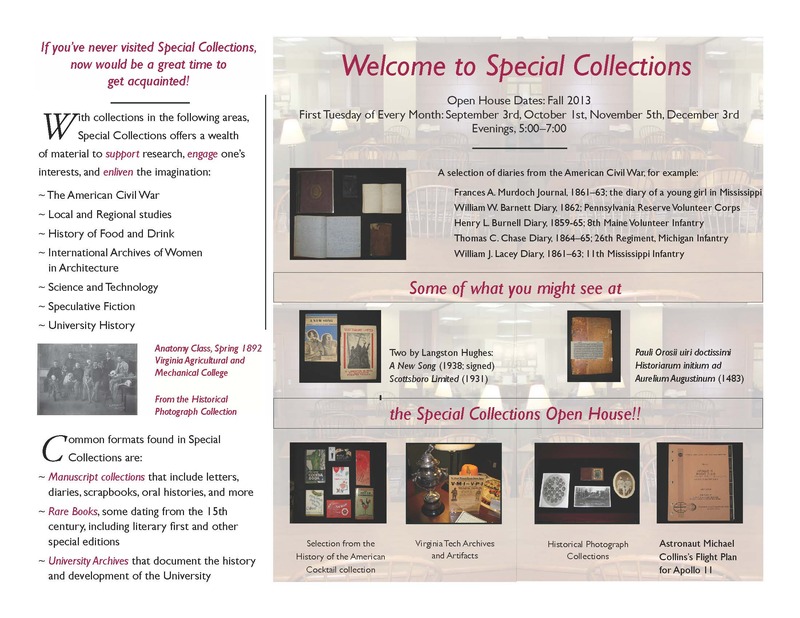 I’ve worked at Virginia Tech Special Collections with the History of Food and Drink Collection for more than 6 years. One of my biggest challenges is finding ways to make it seem usable and relevant in the classroom. After a week of conversation and collaboration, I’m looking forward to reflecting on how I can broaden the way I think about our collection and its use, and how I can encourage faculty and students on campus to do the same. Hopefully, I can find some angles to entice classes in unexpected areas of study to pay us a visit. Finally, after going on way to long, I’ll leave you with two more images (no, not me washing butter–but a picture of that DOES exist!). They are two food items vital to the history of food and culinary culture in America and abroad. If you want a bit of my experience from last week, give yourself five minutes to consider them. It might just surprise you how politically charged your morning beverage might be. 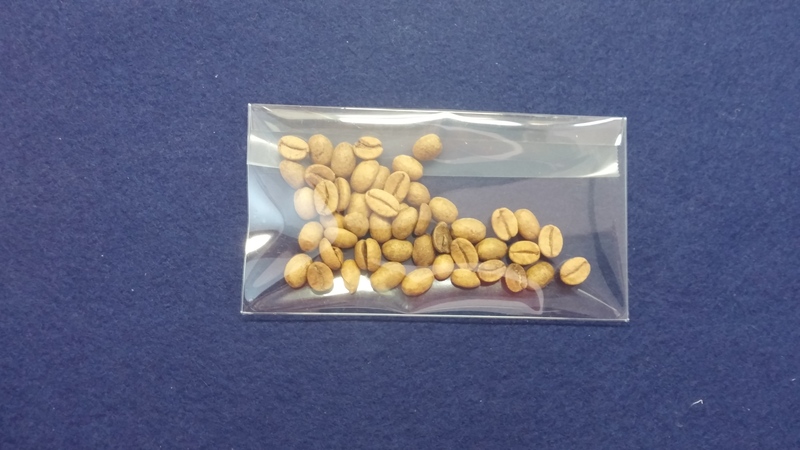 Unroasted coffee beans taken from the desk of General Ulysses S. Grant. Some of our readers may know (and some of you may not) that Special Collections has a second blog. Launched in January 2014, it highlights materials from all of our collecting areas and features contributions from all our staff. 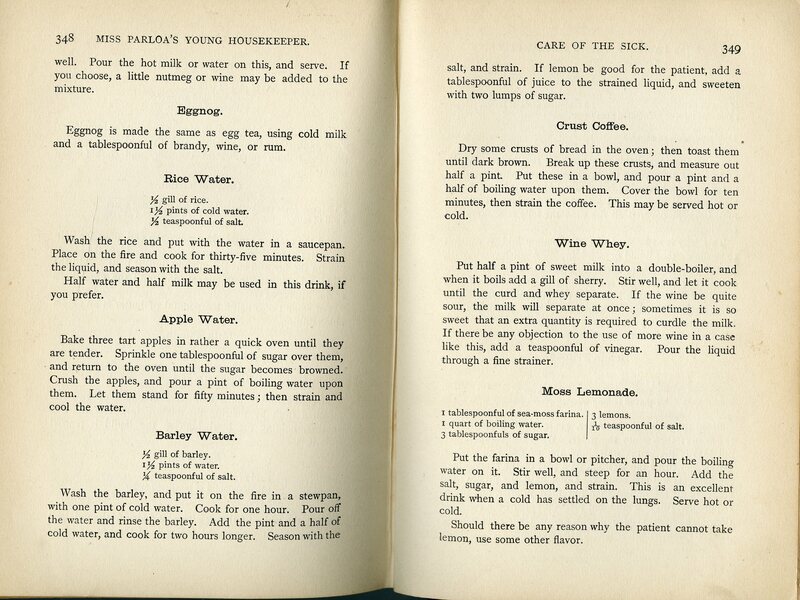 Last week, our university archivist wrote a post about a handwritten cookbook we acquired last year. It was kept by Cora Bolton McBryde, the wife of Virginia Agricultural and Mechanical College president (from 1891-1907), John McLaren McBryde. 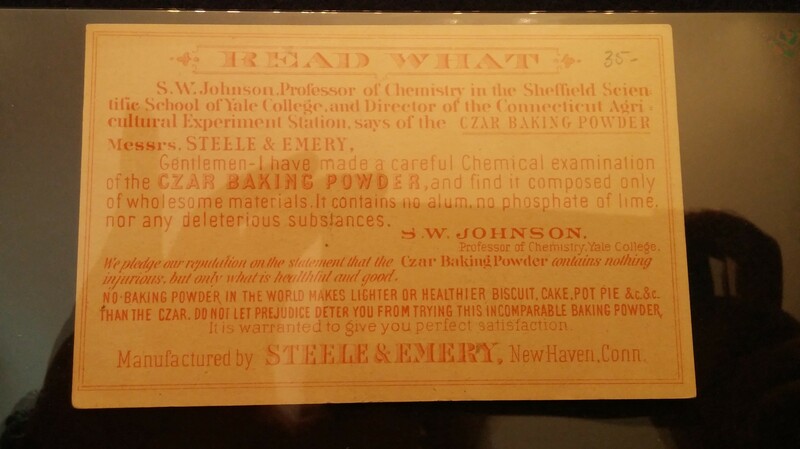 It’s a very interesting piece of university history AND food history. So this week, our feature comes from our other blog. 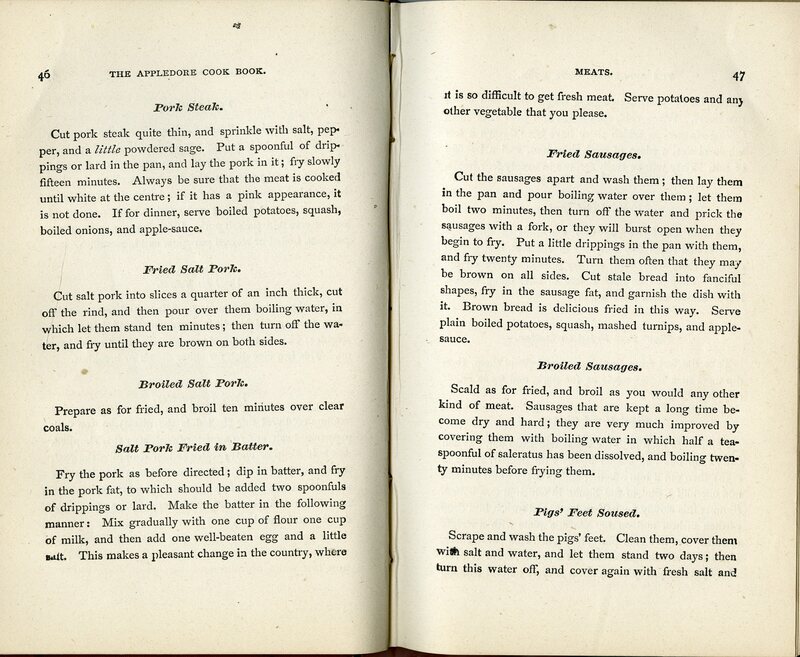 You can read about the cookbook, its preservation, and a little about the McBrydes here: http://vtspecialcollections.wordpress.com/2014/07/17/cooking-for-the-president-cora-bolton-mcbrydes-cookbook/. Enjoy! There will be a new feature post this week (a little late), but in the meantime, here’s a heads up! Once again, Special Collections will be hosting a series of four (that’s right FOUR!) Open House evenings during the Fall 2013 semester. (See the flyer below.) Among the materials on display will be some more recent additions to the History of Food and Drink Collection. Who knows what we might share! Cocktail publications, handwritten receipt books, corporate pamphlets, and cooking ephemera–it’ll be a surprise! So, even if you’re joined us before, we’ll hope you will consider visiting us again. Open House events will be on the first Tuesday of every month (September 3, October 1, November 5, and December 3) and will take place from 5pm-7pm. Special Collections is on the first floor of Newman Library, near the study cafe. March, as some of you may know, is Women’s History Month. 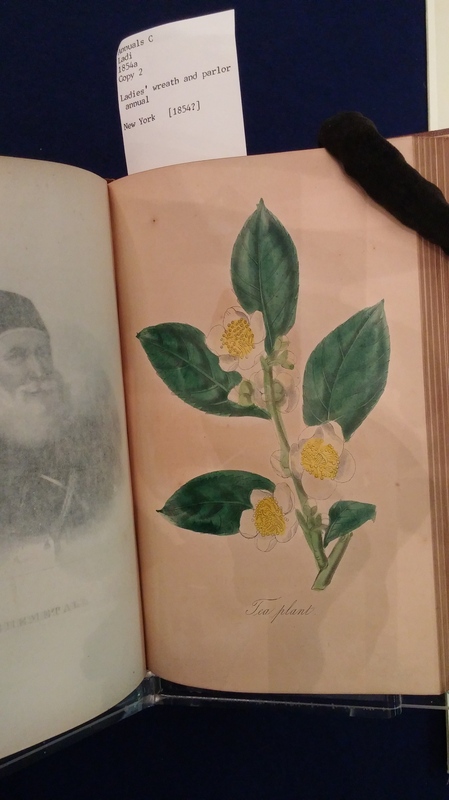 While a good portion of what we talk about on this blog relates to women’s history, it seems like a good opportunity to explore the contributions of some authors, educators, and cooks (and sometimes, all three at once!). 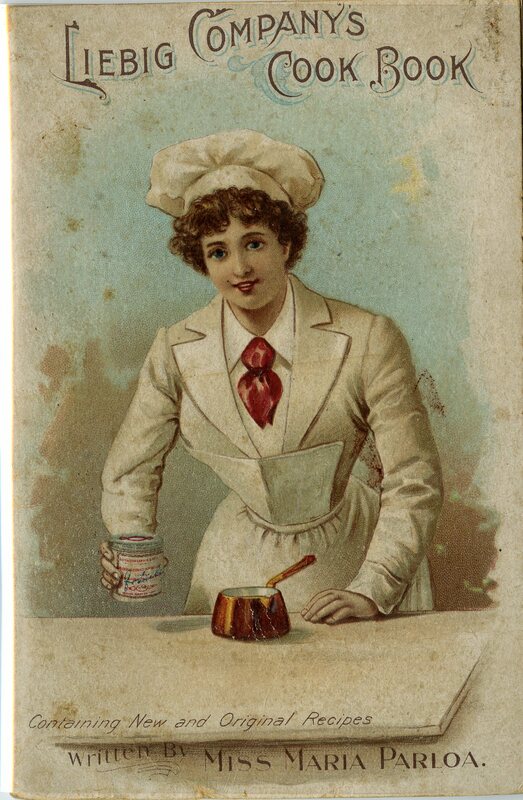 Each week this month, we’ll share a little about an influential lady from late 19th/early 20th century culinary history. They may not be household names these days (or even in their own time), but their works paved the way for modern home economics, cooking, and cookbooks. 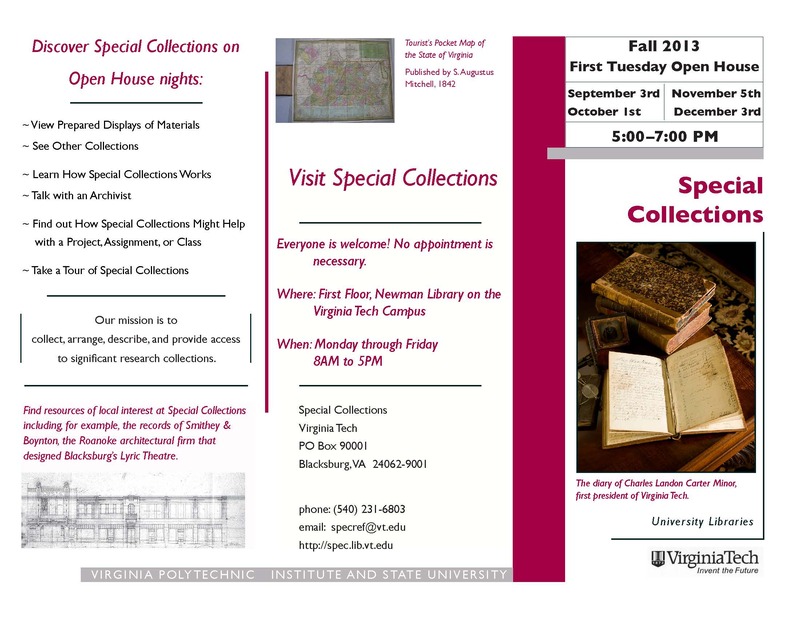 On a side note: if you’re in the Blacksburg area, we always invite you visit Special Collections. This month, we have two small exhibits devoted to women’s contributions to science, technology, science fiction, architecture, literature, culinary history, and more! You can also go “hands-on” with examples of items in our collection. We’ll also be profiling manuscripts, publications, and items on the Special Collections blog on Tuesdays during March. Maria Parloa was born in Massachusetts in 1843. 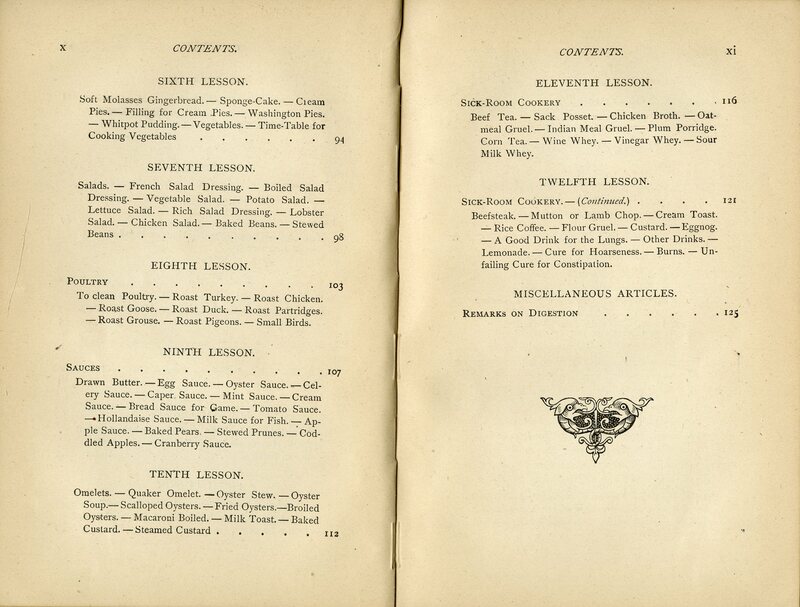 Even before she entered a teacher’s school in Maine in 1871, she had experience cooking in homes and hotels in New England. 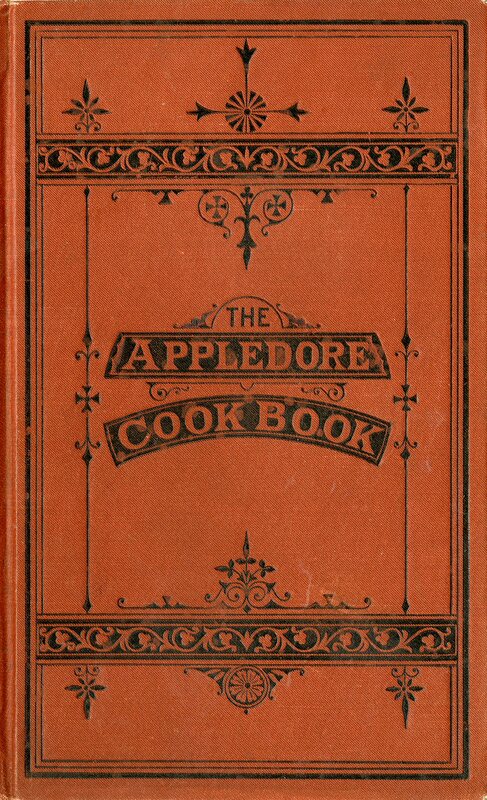 In 1872, while still in enrolled at the Normal School of the Maine Central Institute in Pittsfield, she published her first cookbook, The Appledore Cookbook (ours is the later 1878 edition). After several years of teaching in Florida, she eventually relocated to Boston, Massachusetts–she had visited several times to lecture and felt there was a gap. By 1877, she opened a cooking school. 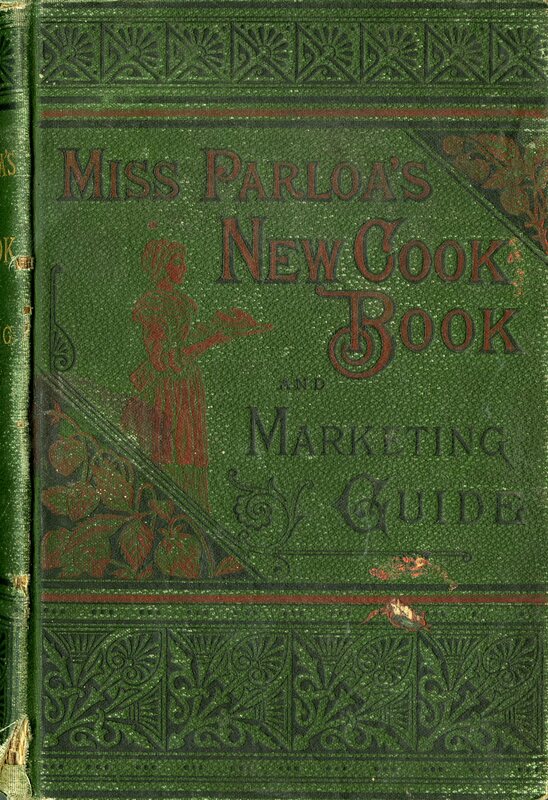 Two years later, she became one of the first instructors at the famed Boston Cooking School.By 1880, she had authored two more books, First Principles of Household Management and Cookery: A Text-Book for Schools and Families, and Miss Parloa’s New Cook Book: A Guide to Marketing and Cooking. In 1883, she left her cooking school and Boston for new opportunities in New York City, where she opened a new school. She continued to teach for the next four years before eventually taking more time to write and travel. 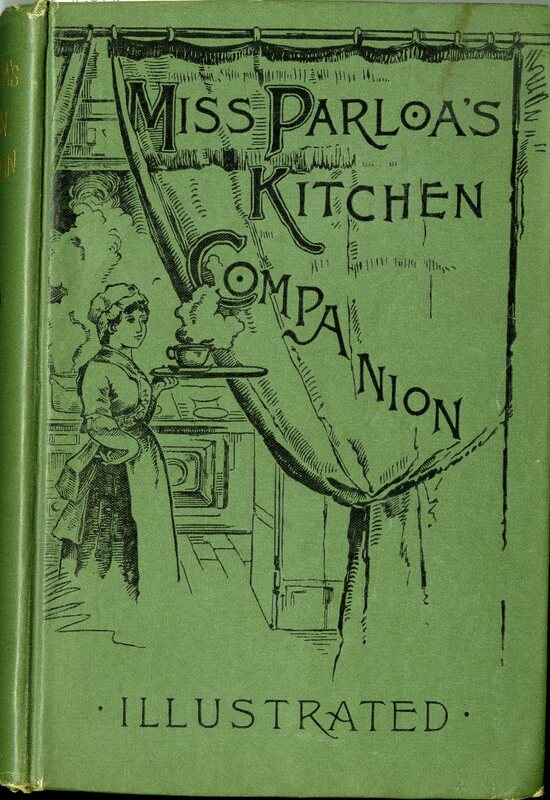 During the late 1880s and early 1890s, she was prolific, publishing later editions of earlier books, as well as three new ones: Miss Parloa’s Kitchen Companion: A Guide for All Who Would Be Good Housekeepers in 1887; Home Economics: A Guide to Household Management in 1889 (we have the 1898 edition); and Miss Parloa’s Young Housekeeper: Designed Especially to Aid Beginners: Economical Receipts for Those Who are Cooking for Two or Three in 1893 (we have the 1895 edition). Parloa was among the nation’s first home economics instructors and her focus was broad. She was also one of the first to embrace/promote a brand. 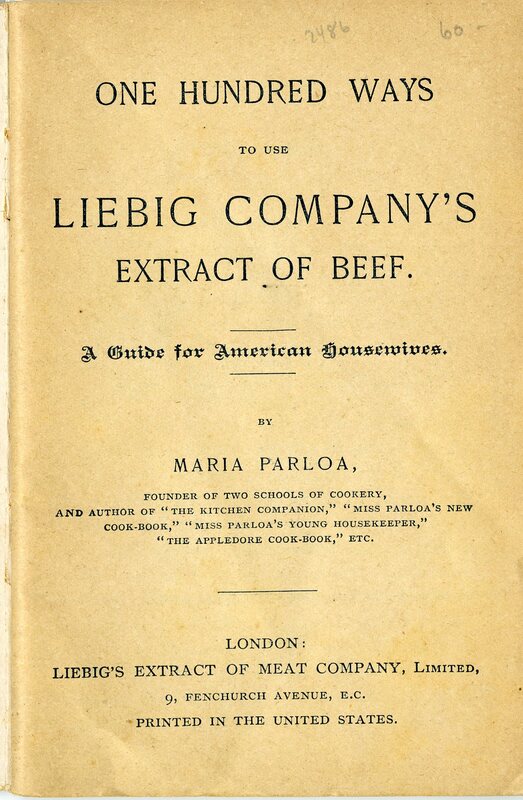 Last summer, we acquired One Hundred Ways to Use Liebig Company’s Extract of Beef: A Guide for American Housewives, published in 1897. 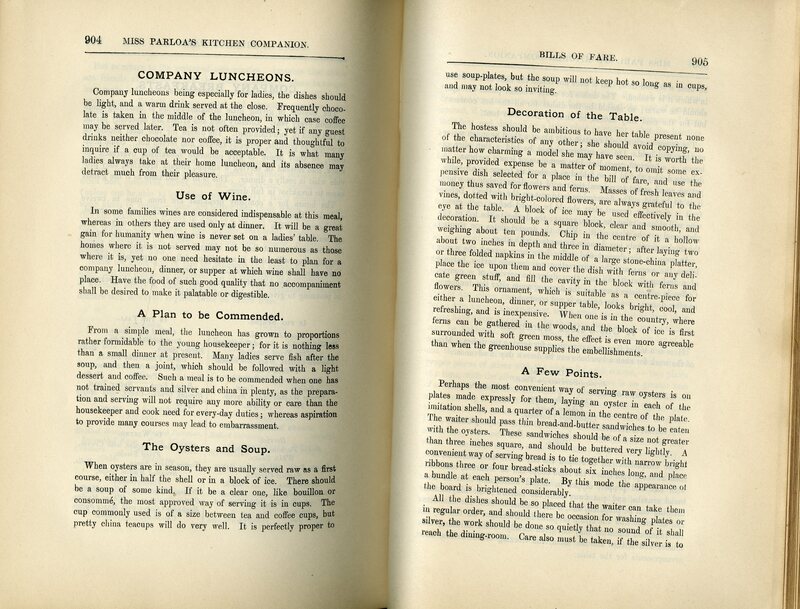 Parloa also endorsed and created publications for Walter Baker Chocolate in the 1890s. By 1903, Parloa had mostly retired from writing. She moved to Bethel, Connecticut, where she lived until the time of her death in 1909. 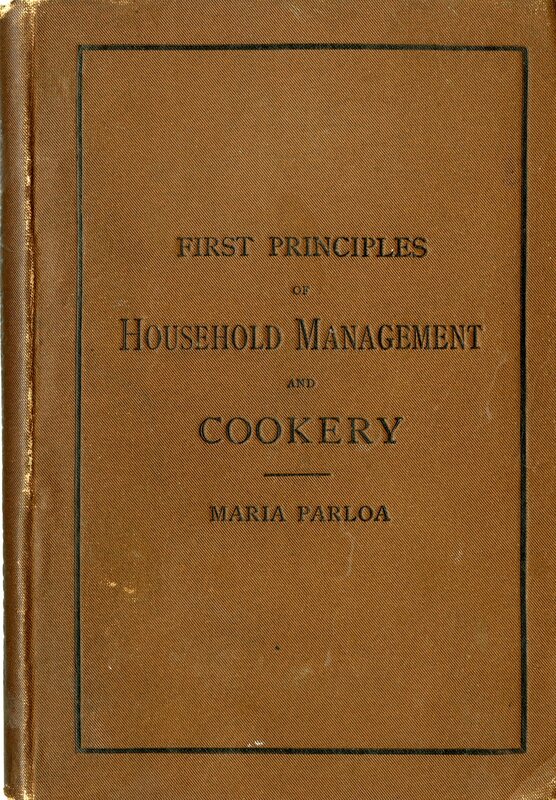 Maria Parloa was devoted to an all-around home economics education, as her book titles and the contents suggest. 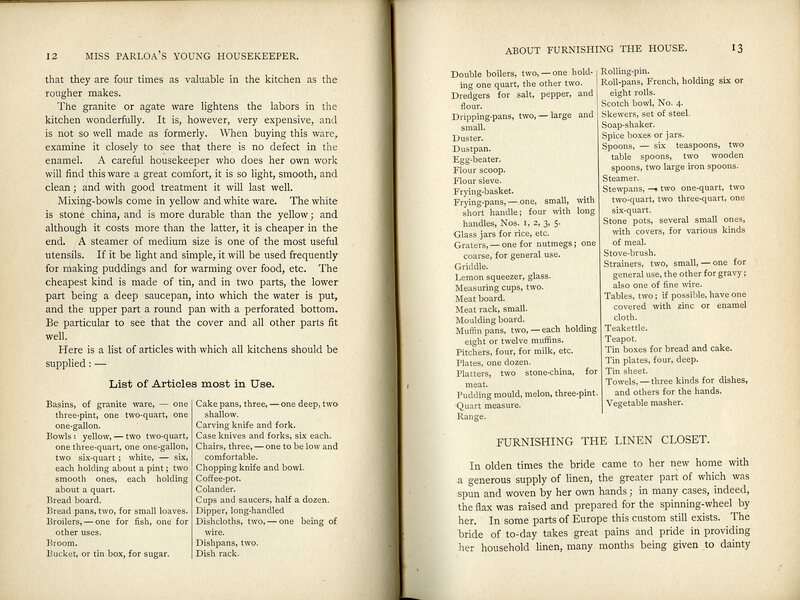 In addition to recipes, she featured directions for maintaining a clean and orderly home, thriftiness, hygiene, and temperance. 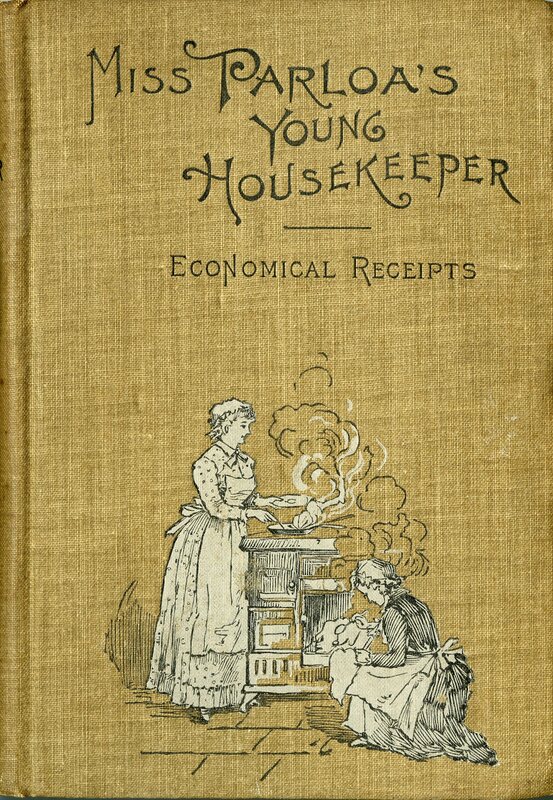 She worked to provide a wider education in household management, caring for the home and family, and cooking techniques, and she was an important influence in the rise of home economics. Special Collections’ Rare Book Collection includes 10 of Maria Parloa’s books. You can see a list of our holdings here: http://tinyurl.com/mariaparloa-vtsc. 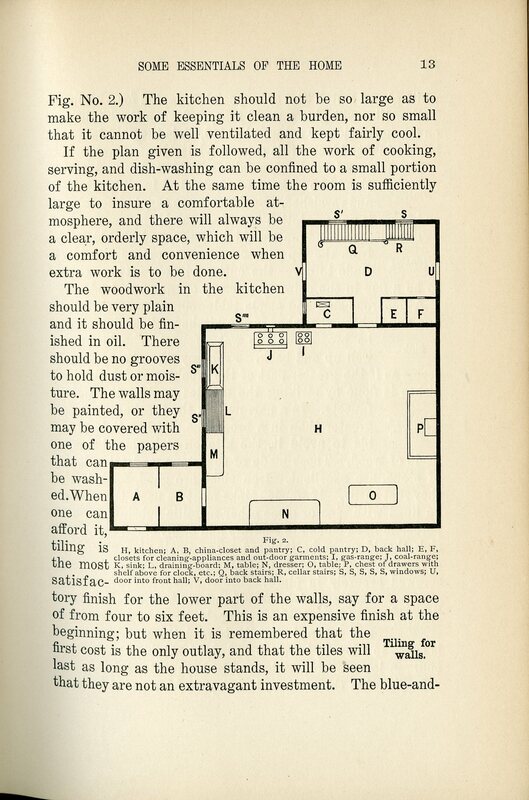 A New York Times description of one of her classes, published in 1882, is available online. A lengthier biography is available on the website of the Bethel Public Library, which began with a donation from Parloa. 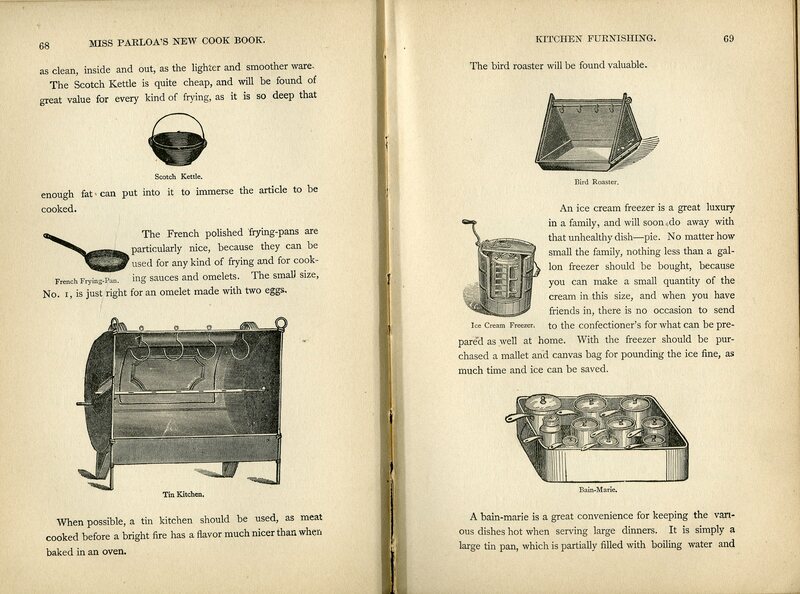 Next week, we’ll look at another important figure in the Boston Cooking School, Fannie Farmer. Until then, be sure your pantry is organized and your luncheons are simple! 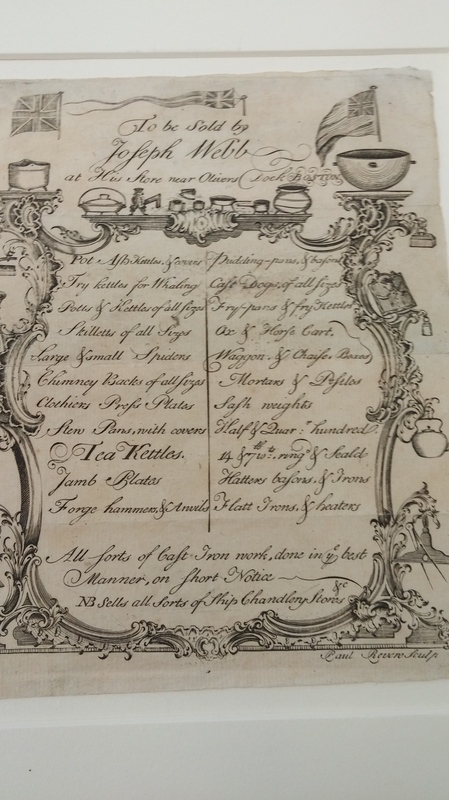 Each week, Special Collections shares an item or two from the History of Food & Drink Collection with you. We keep showing you all this cool stuff, but we haven’t spent much time showing you how to locate materials from our collections yourself! This Wednesday is a diversion into a library catalog and finding aids tutorial, with an eye toward the History of Food & Drink Collection. 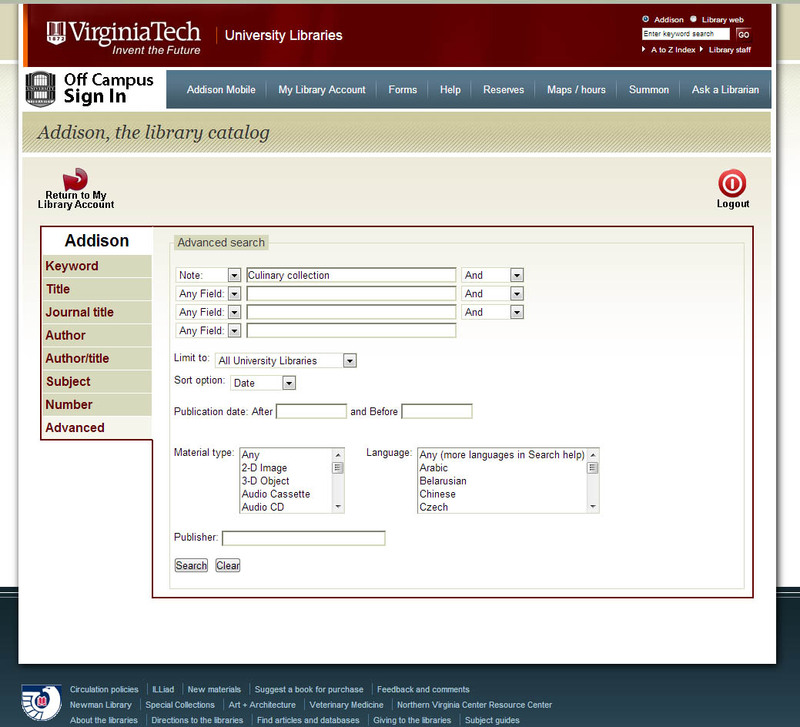 The University Libraries have a traditional catalog, Addison (fun fact: it’s named for the first registered student of VAMC in 1872, William Addison Caldwell), as well as a discovery system that searches the catalog and a number of other integrated resources, called Summon. Since the descriptions of materials in the History of Food & Drink Collection are located either in the library catalog or the finding aid database, Virginia Heritage, we’re going to save Summon for another day. Once you hit “Search,” you’ll get a list of all the books and manuscript collections in the History of Food & Drink Collection! Caution: They’ll be more than 3600…. But if you’re looking for something more specific, trying putting a keyword or two in the second box above (the first one labeled “Any Field”). If you’re only interested in what we have in Special Collections, you can select “Special Collections” from the “Limit to:” box. The search below, for example, would pull culinary books in Special Collections with “Betty Crocker” somewhere in the record. If you’re only interested in publications from a certain time period, try using the publication date fields to limit a search. 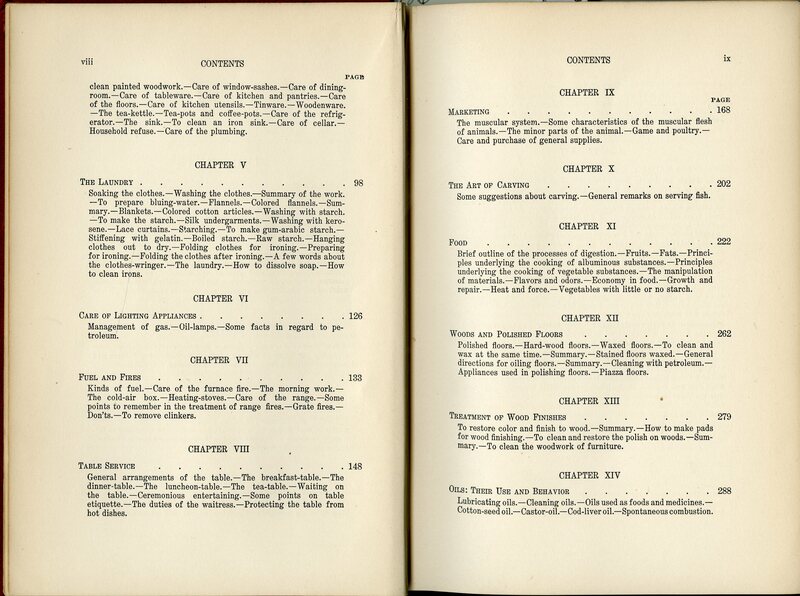 Or if you’re only interested in books, you can scroll down the “Material type” field, locate “Books,” and highlight it. 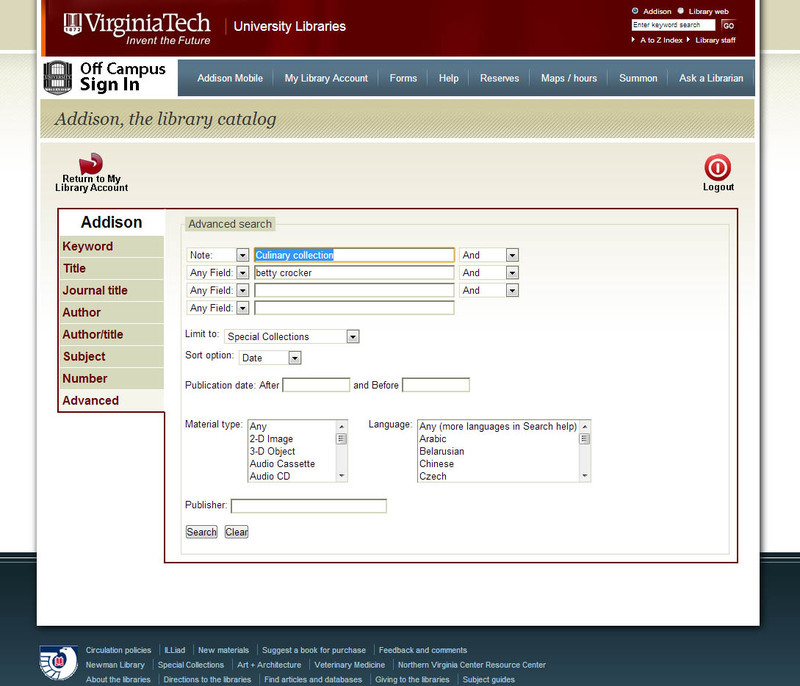 When it comes to locating materials in specific subcollections, Addison can help with that, too. 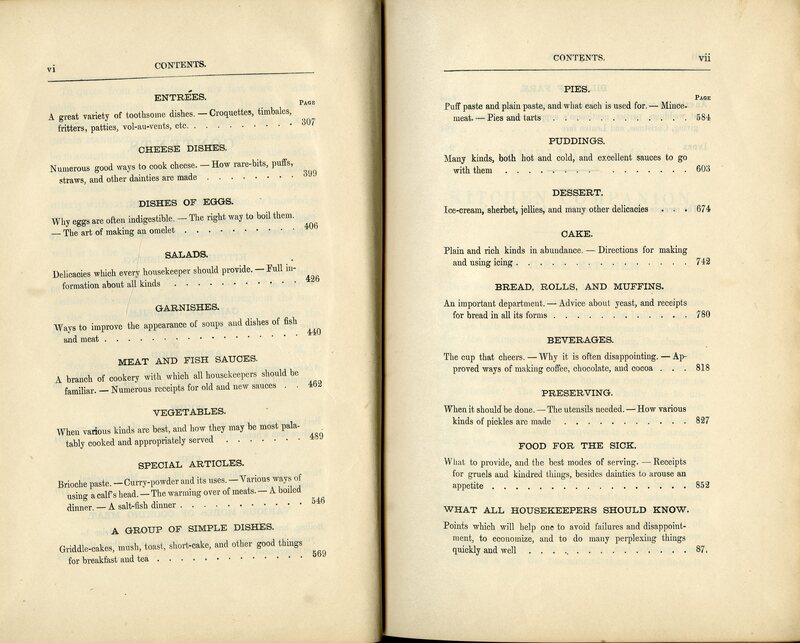 We have two subcollections that we are making a concerted effort to label within catalog records: the Ann Hertzler Children’s Cookbook and Nutrition Literature Collection and the new Cocktail History Collection. Books and manuscripts from these subcollections will be labeled as part of the History of Food & Drink Collection, but they’ll have an extra note, too. If you’d like to see the more than 400 titles in the Hertzler collection, search “ann hertzler childrens” in the note field. If you’re interested in cocktails, search “cocktail history” in the note field. 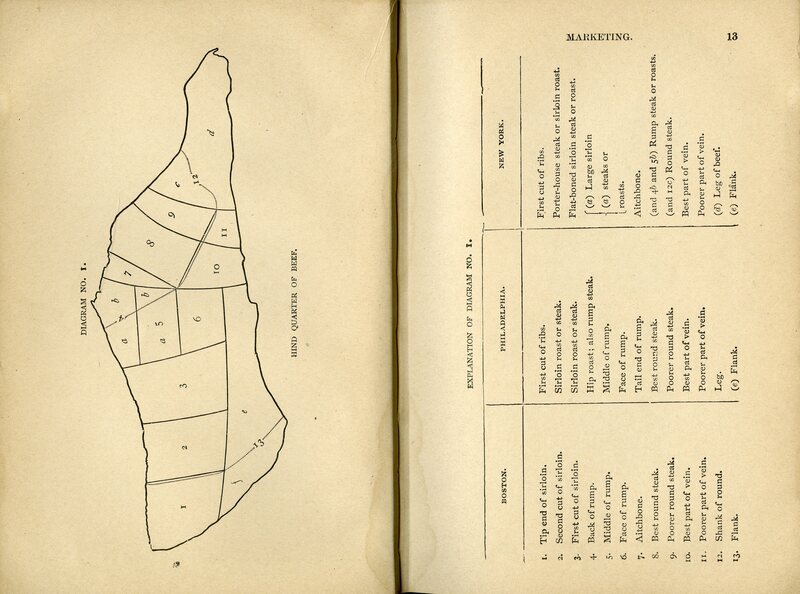 As for manuscript collection relating to food history, we’ve been working hard to build up our holdings. To date, we have more than 30 collections of personal and professional papers, handwritten receipt books, and advertising/promotional materials. And there’s more to be processed! We write finding aids (collection guides) for our manuscript collections and contribute them to state-wide consortia. 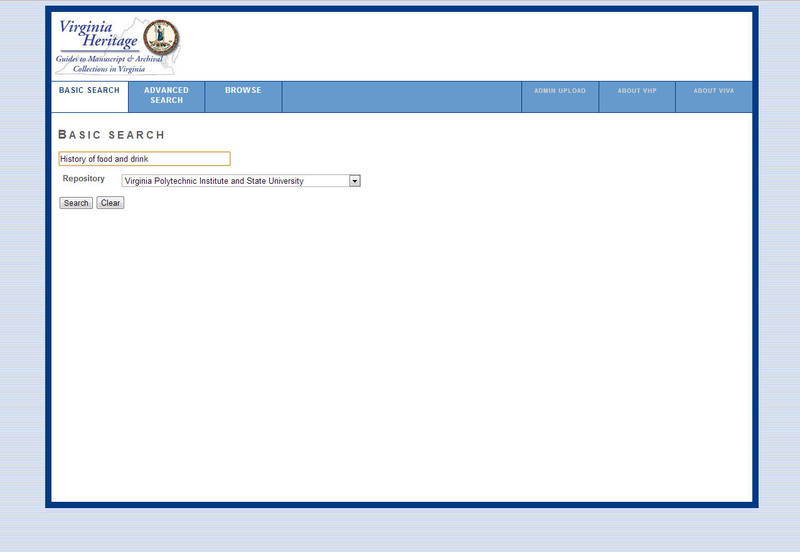 The easiest way to learn about our manuscripts is through this site, Virginia Heritage: http://ead.lib.virginia.edu/vivaxtf/search?smode=simple. 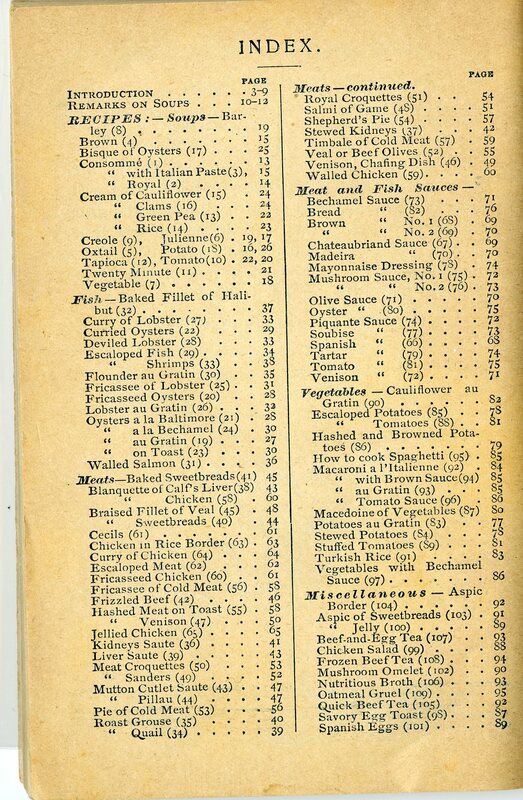 On the main search page, simply search for “History of Food and Drink” (this is our own subject heading that we include in the finding aid text) and be sure to limit the search to Virginia Polytechnic Institute and State University. Or don’t, and see what other culinary goodies are hiding across Virginia (though you may want to try a more general keyword search, since other institutions won’t be using our subject term)! We hope this helps you a little bit, whether you have research in mind, or you just want to satisfy your curiosity. And if you have questions or problems, you can always contact us! That’s what we’re here for and we’re always glad to help you locate books, collections, and other tidbits in Special Collections. Happy searching! And stay tuned for a second post later this week. A brand new exciting book arrived while this post was in progress and we can’t wait a whole week to share!